Electric fireplaces are easy to install. For homeowners who long to add a fireplace to their home, nothing is easier to install than an electric fireplace. Electric fireplaces require only an outlet; there’s no other fuel source to worry about, and they don’t need ventilation like traditional wood-burning or gas fireplaces. Electric fireplaces can be installed nearly anywhere in your home, and depending on how you choose to set your electric fireplace into your wall, the only cost of adding an electric fireplace is the fireplace itself. Electric fireplaces are an efficient way to add warmth. Electric fireplaces and stoves allow you to add heat where you need it. An electric fireplace or stove can add heat to a cold spot in your home, making the room cozier. By adding an electric fireplace or stove to the rooms you spend the most time in, you can get heat where you need it without increasing the thermostat for the rest of your home. Because electric fireplaces don’t use much energy, you get heat and comfort without a big hit to your energy bill. Electric fireplaces are easy to control. With an electric fireplace, you get a fire when you want it, and you get just the amount of heat that you want. With an electric fireplace, you just flip a switch to ignite your fireplace. 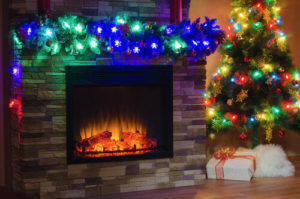 Many also allow you to control the temperature of your fireplace, so that the heat output adjusts to keep your home at the desired temperature, and some models even allow you to operate the fire without the heat, so you can enjoy the ambiance of your electric fireplace even when you don’t want the added heat. Electric fireplaces can be tailed to your home’s design. More than any other type of fireplace, electric fireplaces and heating stoves allow a great deal of flexibility in their installation. Some units are freestanding, so you can place them where you want them, and even move them around your home if you want to add style or ambiance to another room. There are wall-mounted electric fireplaces and tabletop electric fireplaces. You can even create a hearth and build your electric fireplace into your wall to make it look like a traditional fireplace. Electric fireplaces are a safer option for heating your home. If you are accustomed to adding warmth with space heaters, an electric fireplace offers a safer alternative. And because no real combustion occurs with an electric fireplace or heating stove, you don’t have the fire safety concerns that come with a gas, wood-burning or pellet fireplace or heating stove. If you are ready to upgrade your home with an electric fireplace, stop by Tri-County Hearth & Patio! We carry a range of electric fireplaces and electric heating stoves, and we can help you choose the one that’s right for your home.